전문분야 TESOL 자격증을 소지하신 15년 티칭경력의 전문 ESL 선생님입니다. 미국 콜로라도 출신이며, 스페인어, 벵골어를 공부하셔서 학생들이 외국어 공부가 얼마나 힘든 일인지 공감해주시고, 최선의 방법을 제시하여 주십니다. 엔토 매니저님! Sarah_Co 선생님은 어떤 분이신가요? 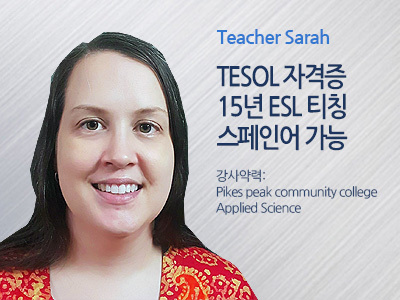 TESOL 자격증을 소지하신 15년 티칭경력의 전문 ESL 선생님입니다. 미국 콜로라도 출신이며, 스페인어, 벵골어를 공부하셔서 학생들이 외국어 공부가 얼마나 힘든 일인지 공감해주시고, 최선의 방법을 제시하여 주십니다. Hello, my name is Sarah. I have a degree in Applied Science. 안녕하세요. 제이름은 Sarah 입니다. 저는 applied science 학위를 갖고 있어요. I was born and grew up in Colorado in the United States. I also lived for 10 years in NYC. So I am very well acquainted with a variety of English speaking accents. I currently live in Bangladesh. 미국 콜로라도에서 태어나서 자랐습니다. 또한, 뉴욕에 10년동안 살았기 때문에 다양한 영어 액센트에 아주 친숙합니다. 현재는 방글라데시에서 살고 있습니다. I have 15 years experience in teaching the last 7 of which have been in Asia. I learned to speak Spanish while in college. I took a Tesol language course for Bengali. I speak Bengali on a daily basis so I am familiar with Asian language, grammar and way of thinking. I continue to study a foreign language so I know what it is to be a student. This makes me a compassionate and understanding teacher. 저는 15년 티칭경력이 있으며, 지난 7년동안은 아시아지역에서 티칭 경력이 있습니다. 대학에서 스패니쉬를 배웠고, Bengali를 이해하기 위해 TESOL 자격증을 취득하였습니다. 저는 Bengali를 매일 사용하기때문에 아시아지역 언어, 문법, 생각하는 방법에 아주 익숙합니다. 저는 외국어를 계속 공부해서 외국어를 배우는 학생의 입장을 충분히 이해할것입니다. 이는 제가 학생들을 공감하고, 이해하는 선생님이 되도록 도와줍니다. I look forward to being your teacher. Thank you. 여러분의 선생님이 되기를 바랍니다. 감사합니다.